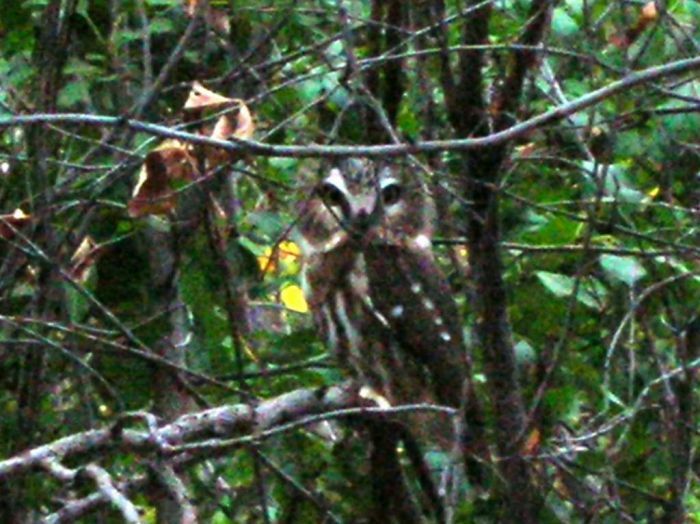 This tiny owl was perched in a large (40+ foot) conifer, fairly close to the trunk, at a height of about 6-7 feet. Photo by Dan Mason. Taken: 2018-11-20 Heritage Hills nature park, about 1 mile south of Fargo in eastern Cass County, along the Red River. 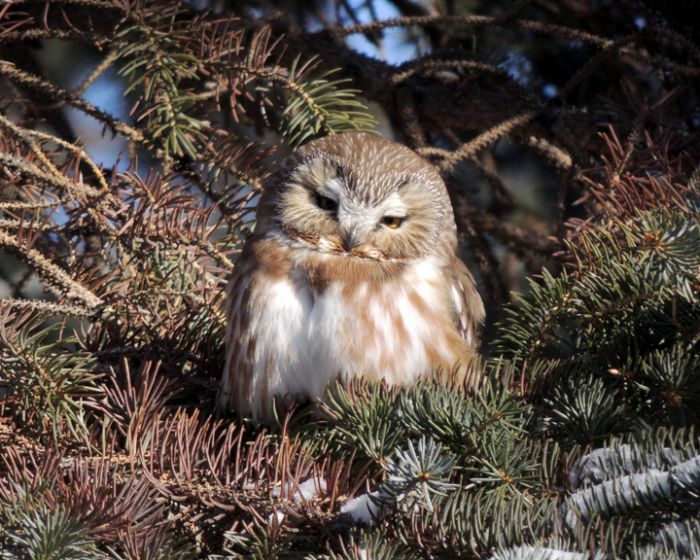 This NSWO was seen soaking up some sun on a sub-zero winter's day in Cass County's Heritage Hills park, a few miles south of Fargo. Photo by Dan Mason. Taken: 2018-01-12 Eastern edge of Cass County, along the Red River of the North. 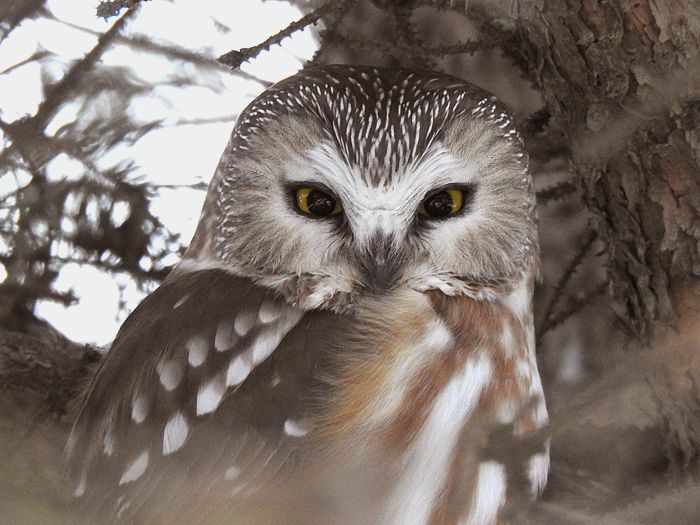 A second Northern Saw-Whet Owl was discovered in Forest River Park by another birder (thanks, Brittany! ), who guided us to see it. 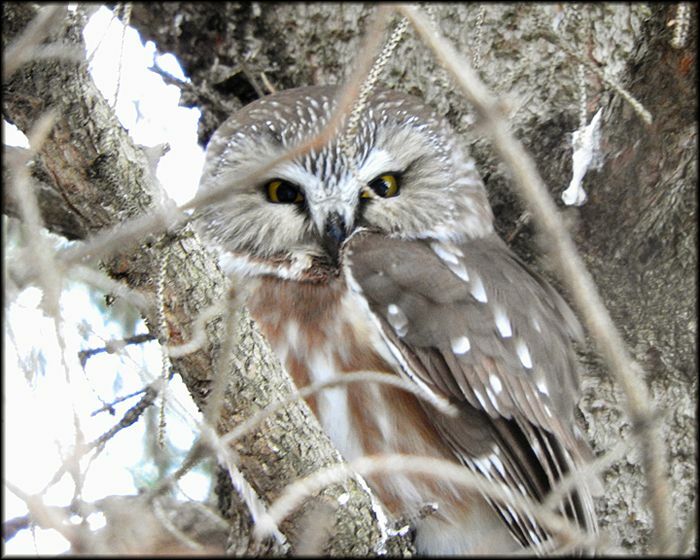 The bird is about a half-mile away from the Saw-Whet Owl found earlier in Orchard Glen. Photo by Dan Mason. Taken: 2017-01-27 Roosting in a non-native decorative shrub about 75 yards east of the Forest River parking lot. Seen on a roost in Fargo's Orchard Park along the Red River, this tiny owl went back to sleep less than a minute after I discovered it. Photo by Dan Mason. 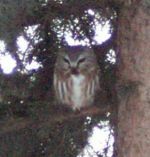 Taken: 2017-01-25 Eastern Cass county, Fargo's Orchard Park, in a conifer grove along the south side of the loop path. 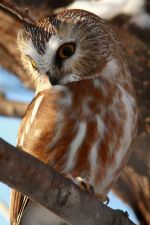 Spotted this bird while walking near the river south of Mandan in Graner Bottoms. Photo by Derek Stout. Found and Photographed by Corey Ellingson in Sleepy Hollow Park, Bismarck. 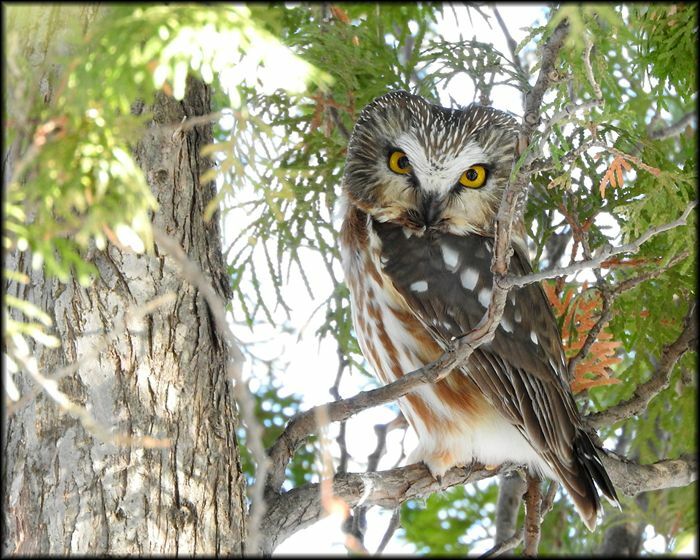 There were two individuals present, 40 feet apart, still present the 16th. Photo by Connie Norheim. found by Dennis Weisenborn.